There are many things to consider when purchasing a rug. Perhaps you already have one and you aren’t sure how to maintain it properly. At ReStockIt.com, we offer high quality cleaning products to help you keep your rug looking new! Vacuums: Over time dirt and debris can wear down an area rug and dull its appearance. 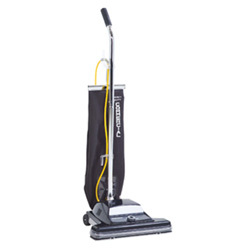 Rugs should be vacuumed weekly and we highly recommend the Nilfisk-Advance ReliaVac 16HP upright vacuum. This is a great tool for getting rid of dirt and debris from your rug. Spot Cleaners: Always keep a spot cleaner on hand to quickly treat soils and stains. Spot cleaners are an easy way to help keep your area rug looking its best. Choose a spot cleaner that is approved for the fiber of your area rug. You should always pre-test a small area on the back of the rug before using the cleaner to spot clean. 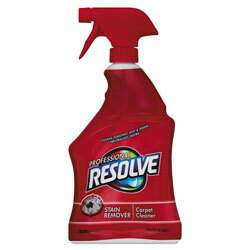 One of our favorite spot cleaners is Resolve Professional Spot & Stain Carpet Cleaner. With this product, cleaning spots is as easy as 1-2-3. Carpet Cleaners: Periodic deep carpet cleaning is a must for keeping your carpets and rugs looking new. 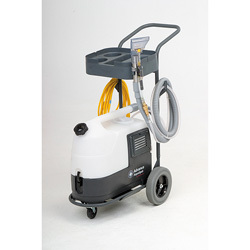 We think the Nilfisk-Advance Cart for Aqua Spot Carpet Extractor is the best value when looking for a cleaner to deep clean your rug or carpet. It even comes with a tray so you can bring your cleaning tools and accessories with you. Focal Point - Area rugs are commonly used to complete a room by creating a focal point where your eyes are naturally and comfortably drawn to. If you would like to make an area rug the focal point of your room, choose bold colors or geometric designs that are naturally eye-catching. Also remember that if you have a piece of furniture you want to create as a focal point, you can use an attention getting area rug. Compliment - If you already have a natural focal point in your room, you can use an area rug to compliment your existing décor. For example, you could use an area rug to complement the existing furniture, paint and focal point in a room. If you would like to use an area rug as a complimentary piece, choose symmetrical or repetitive patterns with subdued colors that naturally fit with your room. TIP: Consider Area Traffic when selecting a rug. Dark colored rugs and sturdy fabrics are best for high traffic areas. Area rugs tend to look best when they are surrounded by a border. In other words, area rugs should not be wall to wall. If you want a rug that covers most of your floor, choose one that is smaller - at least 1 foot smaller on all sides than the rest of the room. Rugs should be at least 1 foot larger than the furniture they are under. This is particularly true for couches and coffee tables where a rug that is too small is very obvious. The size of an area rug for underneath a dining room table should be at least 4 feet larger than the table on all sides. The extra 4 feet ensure that the rug will be large enough to accommodate the dining room chairs when pulled out. Rugs placed in bedrooms and bathrooms should be soft because they are often walked on with bare feet. Natural fiber rugs like wool and cotton tend to be very soft and are great for bedrooms and bathrooms. TIP: Use masking tape as a template for the rug. It should easily help you determine what size and shape rug will look best in your room. Persian Rugs: Persian rugs are known for their geometric, floral, and pictorial designs. The geometric designs on Persian rugs often feature horizontal, vertical, and diagonal lines while the floral designs usually have a circular pattern. Persian area rug pictorial designs usually feature plants and animals. Persian style area rugs are one of the most popular rug styles throughout the world. Contemporary Rugs: Contemporary rugs have clean, simple and smooth lines. Contemporary area rugs often feature bright bold colors and designs. Contemporary style area rugs are great for making a dramatic statement or creating a grand focal point. Traditional Rugs: Traditional rugs include design elements from both Persian rug and European area rug designs. Common traditional rug designs include geometric and floral patterns in bold or muted colors. Traditional area rugs are an extremely versatile rug style and will fit into many different room design styles. Transitional Rugs: Transitional rugs include design elements found in both contemporary area rugs and traditional area rugs. Transitional area rugs include both color and design elements from contemporary and traditional rug styles. They are by far the most versatile rug styles and will work in practically any home. If you are unsure of other styles, a transitional style area rug will be a great choice. Casual Rugs: Casual rugs are warm and inviting rugs that can feature several different designs. Many casual area rugs often have horizontal lines or soft asymmetrical patterns with gentle lighter colors. Casual style area rugs are wonderful for rooms where a comfortable atmosphere is desired. French Rugs: French rugs generally feature symmetrical floral designs in soft and warm colors. French rugs are typically known for grand floral designs. French-inspired area rugs are beautiful additions to any home, but they work particularly well in rooms that have a shabby chic design motif. Southwestern Rugs: Southwestern rugs are uniquely inspired by the Southwestern United States. Southwestern area rugs often feature earth tones with geometric designs that are either symmetrical or asymmetrical. Southwestern style area rugs are relaxing rugs that are perfect for anyone with an appreciation for Southwestern inspired design. The most common mistake when buying a rug is choosing the wrong material. Choosing the right material for your rug will help you increase its lifetime durability and endurance. TIP: The amount of foot traffic over the area rug should influence your decision over the area rug material. Before choosing the material and fiber for your area rug, determine how much foot traffic your area rug will be exposed to. Light/Moderate: Light to moderate foot traffic occurs when there will be little to no foot traffic in the area where the area rug will be located. If you plan on putting your area rug in a room that is not used very often, like a formal living room or guest bedroom, then you would likely need a rug that can withstand light to moderate foot traffic. Heavy: Heavy foot traffic includes areas where the rug will be walked on regularly and/or will be regularly exposed to soilage or spillage. As a general rule, families with young children and pets will most likely need a carpet that can withstand heavy foot traffic. Also, stairs and entryways are almost always considered high traffic areas. A less expensive alternative to wool rugs. Less durable and expensive than wool or cotton rugs. Ideal for low traffic areas. Available in limited color selections. If left untreated, dirt and other debris will eventually ruin even the highest quality rug.